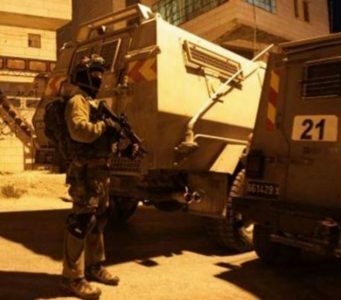 Israeli soldiers abducted, on Wednesday evening, two Palestinian children near the northern entrance of the West Bank city of Bethlehem. The Bethlehem office of the Palestinian Prisoners’ Society (PPS) has reported that the soldiers abducted the two children near Bilal Bin Rabat Mosque, and took them to an unknown destination. It identified the two abducted children as Nader Samir Shallash, 14, from Doha town, west of Bethlehem, and Moayyad Khaled Jawarish, 13, from Beit Jala city. The two were handcuffed and blindfolded, before the soldiers took them to an unknown destination.